What does residue of last season's leguminous mulch look like going into year two? 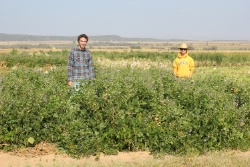 In year one of our research in South Africa, we began trialing a number of leguminous, green manure cover crops (gm/ccs) for their effect on soil health. During the growing season, the crop cover looks very impressive. Pictured here is lablab grown in a zai system. So, it does dry down quite a bit. Redigging the zai holes in year two is a bit of a challenge but not insurmountable. 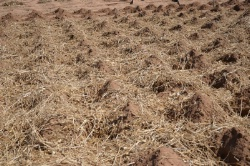 Based on results from a previously conducted legume screening trial, dry lablab residue contained about 1.8% nitrogen. It will be interesting to see, going forward, the effect of this biomass on sorghum growth in year two.